My friend Usha of Mahas lovely home approached for guest post to celebrate 3rd blogging anniversary. I was so happy and wanted to present a sweet dish wishing her more success in whatever she does. Please visit her page where she hosts amazing recipes covering all cuisines. A very dedicated and talented blogger. You can check my recipe in her page too. This sweet dish is something different from my regular recipes but still tried to add healthy ingredients to it. 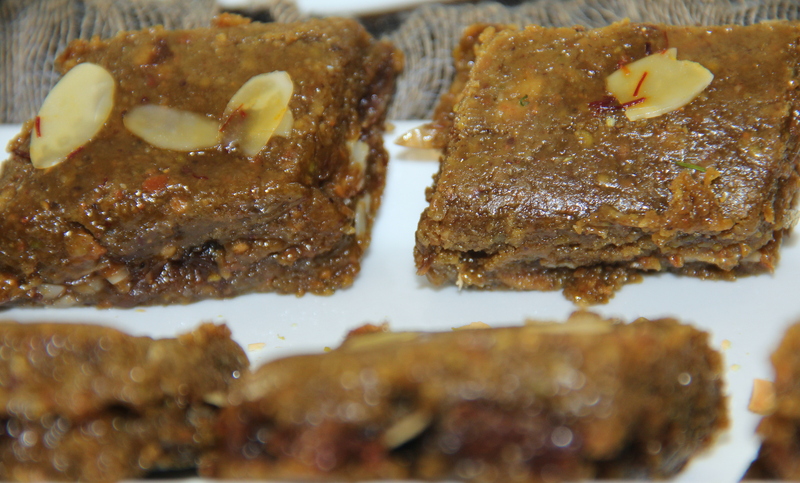 Kaju (Cashew) Katli is a well known sweet but many blogger friends has already made them. So thought about Pista Katli and Badam (Almond) Katli then amalgamated both and made Pista-Almond mix. However for filling wanted to try new ingredient. The Gulkand (Rose Petal Jam) was appealing to me that’s how this recipe called ‘Pista-Badam-Gulkand Sandwich’ created. Here the Pista and Almond is powdered and then mixed in the sugar syrup. I just chopped the nuts and powdered them. You can even pre-soak blanch, make a paste and use to make katlis also. 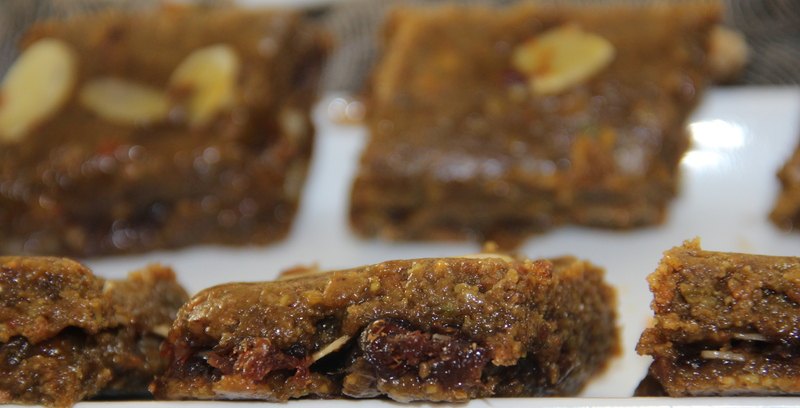 Sweet can be manipulated as per the taste and without using gulkand just pista-almond katli can be enjoyed as it is or can customise the filling as per the taste. Blend pistachio, almonds in blender/food processor and keep aside. In a pan add water and then sugar and let it boil on a medium flame for 6-7minutes or till the syrup is of one string consistency, while stirring occasionally. Add the ground pistachio, almond powder mix well and cook on a slow flame until the mixture leaves the sides of the pan, while stirring continuously. Let it cool a bit then it form the dough consistency..
First layer-Take the half of almond burfi dough prepared earlier and place in between the two sheets of plastic/baking sheet and roll out till it is 6mm (1/4”) thick. I used skinless almonds so skipped the procedure of blanching, you can blanch almonds or use store bought skinless almond flakes. 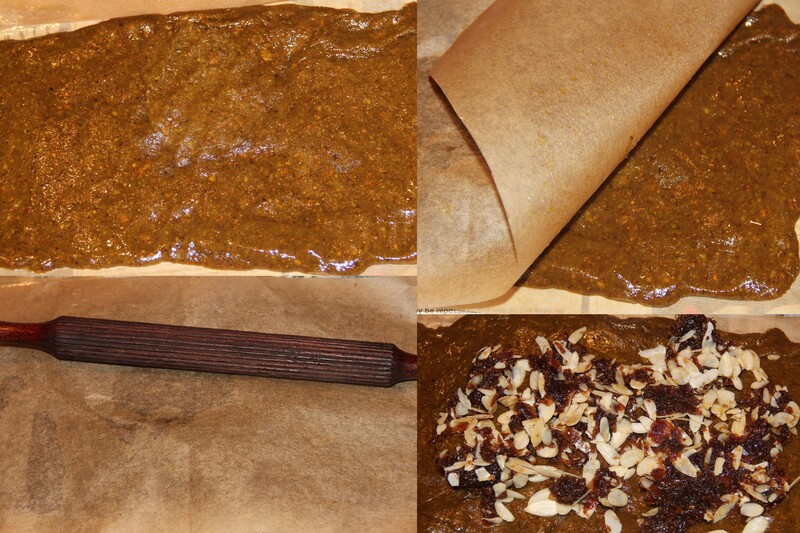 I powdered pistachio and almonds without pre-soaking but if you can soak in milk for 20-30 minutes, blend to paste. In that case the burfi might take some extra time to cook. 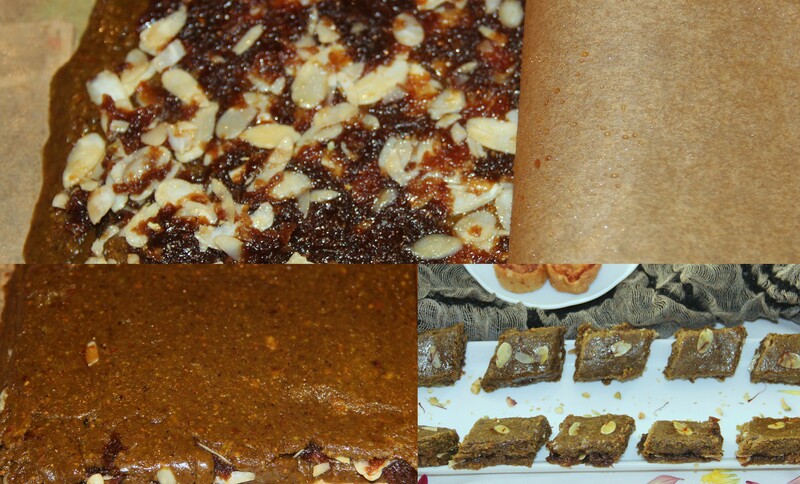 But taste wish I didn’t ind much difference except that using milk might soften burfi a bit. Filling can be personalized as per the taste by adding extra nuts or customizing the sweet. Posted on November 23, 2014, in Indian, Sweets. Bookmark the permalink. 12 Comments. Oh yum, this looks awesome Chitra! I’ve never tried gulkand / rose petal jam before, but that sounds amazing! Wow! I love all the flavors you got going there. Nice!! Congratulations to Usha on her 3rd anniversary and to you on this gorgeous guest post. This sweet treat sounds really delicious. Love anything with almonds, it looks very rich and delicious.